supply power. 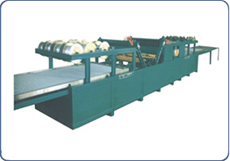 With the automatic orientation of the oblique cutting, cutting , flat mesh and cyst plate, as well as the welding of the oblique quickset and the flat mesh, it produces steel wire forming stable polystyrene plate. Features: automatic product line, high productive efficiency, low rate of mis-welding rate, intense welding pot, uniformity and regular, low production cost.